It's time I put a picture up. I posted a ling to 4wda shed a while ago listing the mods. Too much to rave on about here, it's a working progress but I'm determined to complete it so I can use it as intended. This image was taken at LCMP before Winter set in. Haha, no Canaries were harmed in my travels, but I'm sure if I find a dead one stuffed in my tail pipe I'll know where it came from , but a bird of some sort (couldn't tell which sort by looking at the guts down the side of the car) did come to grief on my headlight guard a while ago. The 'Canary' is a LCMP registration sticker that I didn't bother to put on the windscreen. Hilux is a pain in the bum. Seriously, it's an expensive project already, but due to the rubber bushing commonly blowing out in the lower strut eyes when you add weight over the front, to replace all rubber bushings in the front, just to gain lift and address the strut bushing problem, it's going to be a $1,500 exercise inc labor, which I don't have the tools, nor alignment equipment or heavy spring compressors to add more lift with the bushes done or anything handy to me to be able to save some dosh by DIY. Get this, I was quoted $860 for Avenger bash plates from engine through to gearbox, but not transfer case or anything else (only 3 plates.) Oh, Toyota just reminded me I need to service it soon... another $170. It's safer to run a slot car set lol. 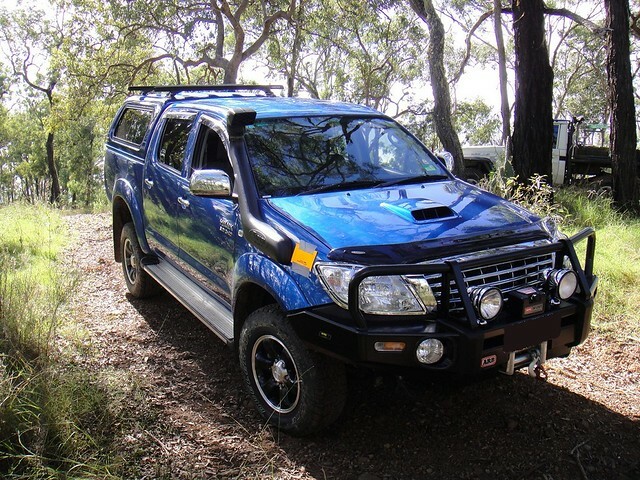 Buying a new 4wd is not all it's cracked up to be and they certainly aren't worth what they ask for them. Oh well, getting there. Another 7k outta complete what I'm doing to it. I should have bought a GU, rebuild the engine and modded that instead, but meh. At the end of the day it's only money and only a car. At least I'll be able to tour. As for shiny, well, it's a major effort to keep it that way, but I'm slowly giving up lol. I also picked up a set of 5 - 265/75-R16 (32") KM2s a while ago, a couple of which were not perfectly symmetrical, but you get that with mudders sometimes. I don't use them on the road as it voids my on-road insurance, so they're recreational wheels only. 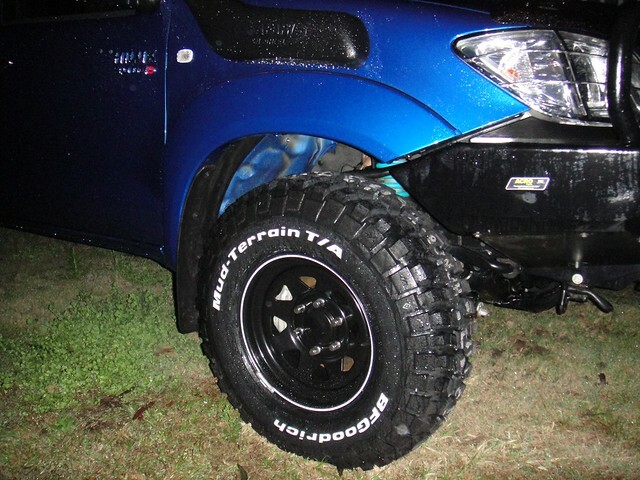 The wheels in the posted pic above are Bridgestone 245/70-R16 LT D694. In the front whilst on road, I run 56psi cold which I find a compromise between road hardness and handling without too much tyre slop in a swerve due the the weight I have in the bullbar and winch. It has extra heavy duty Dobbinsons coils which also speeds up the strut bushing deterioration, but I do gain lift off-road without too much downward bounce and hence loss of clearance. Over-all, it's a comfortable ride on road, without compromising off-road handling with a full 2" legal lift, though currently sitting at approx 1.3" at the front until I do the bushings and add eccentric lower wishbone bushings, then going up the rest by adjusting the strut circlip to highest position.) The ride will stiffen more when I get the poly bushings done, so will let a couple more PSI out of the tyres to try and compensate. You'll also note there are no side steps on it now. I trashed em'. Want some 'naked' sliders now from rocksliders.com.au in Maroochdore. They have a special on this month $150 off, but out of my reach atm. I think there must be something seriously wrong if the rubber bushes keep blowing out I be asking for a 2nd opinion from a different reputable 4wd/suspension place.